MasterChef 2010 winner, Dhruv Baker of Tempus Foods was judged Champion Producer for his pork products – smoked jowl, spiced loin, smoked coppa and house salami. The award for Champion Product went to Phil and Melissa Beals of Beals Farm for their Mangalitza Ham in a well-contested competition to find Britain’s best Charcuterie Producers. Some 432 products made by nearly 100 British charcuterie producers were tasted and judged over nine classes by 33 expert judges, who also selected the two Champions based on their scores across nine different classes. The competition covered British charcuterie made by butchers, farmers, chefs, artisanal and larger-scale charcuterie makers, using pork, lamb, beef, venison, duck, poultry or game. Over 200 gold, silver and bronze awards were given, reflecting the exceptionally high standards of the products entered. The full list of award winners cane be viewed HERE. 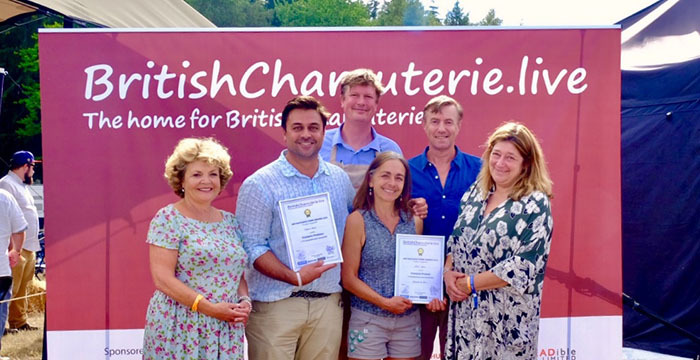 Pictured (left to right) are: Henrietta Green, co-founder BritishCharcuterie.live; Dhruv Baker, Tempus Foods; John Gower, head judge; Melissa and Phil Beals, Beals Farm; and Charlotte Sharpe-Neil, co-founder BritishCharcuterie.live.